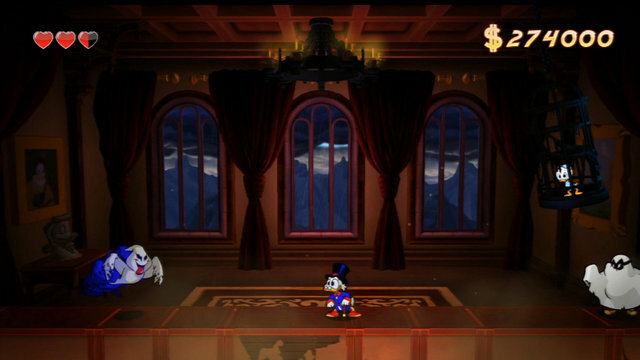 If you’ve played the classic Capcom DuckTales game for the NES or Game Boy, the plot wasn’t presented heavily but with WayForward on the helm, they hope to expand it to have a reason behind going to the moon and Transylvania. At the recent PAX East Transylvania demo, you do rescue Huey, Louie and Dewey but now you’ll see how they get lost and the reason why they’re entering Transylvania in the first place. Capcom producer Rey Jimenez went to to explain how WayForward’s has made sense of the Moon level with a giant rat boss. You still manage to go on a UFO to the Moon in the NES version but now it’s explained why and how you’ll get to there with Gizmoduck. They really wanted to nail down the feel of the cartoon. This makes me even more excited.